Cung Le vs Rich Franklin: 1st UFC Match in China; Macao: Self-Protection Lesson? The UFC video clip below, between Cung Le and Rich Franklin (the first UFC fight in China), demonstrates why making every strike count is important, and why you must strike REAL targets. At mark 0:17 you see Rich Franklin solidly kick Le on the hip. That's a poor target, which didn't cause any damage that matters. At mark 0:17-ish you see Cung Le counter with a solid right to Franklin's jaw; where the jaw hinges to the skull, next to the ear. That's a decent target (and a legal target under UFC rules). At mark 0:18, in less than one second, Franklin hits the ground knocked out. The UFC is competitive sport fighting, of course, but the lesson about striking real targets is even more important when applied to the street. I'm not saying that the jaw joint is a target you want to aim for in a life and death fight. There are much better targets to choose. But these video clips drive home the point about striking the right targets. Franklin kicks Le's hip -- nothing. Le hits Franklin's weak spot on the head -- knock out. In order to do this, you need to know what and where the vital targets are located. Hint: You have nearly 200 anatomical targets on the human body at your disposal to cause pathological injury. A pathological injury is one where the sociopath's body stops functioning normally due to an involuntary spinal reflex... one that you caused. That is to say, the sociopath losses control no matter how much muscle he has, or how much will power he has, or determination, drugs in his system, or even training. He can't function normally, because you don't let him. As Le vs. Franklin clearly shows. This is one reason I've been spending more time training my target accuracy over techniques. The best demonstration and explanation of why you should spend more time on "target practice" and less time on techniques is found in the book How to Survive the Most Critical 5 Seconds of Your Life. It's written by the guys at TFT and goes into a lot more than targets. But it's one of my favorite books on self-protection. It took me a while to understand the importance of spending time on hitting targets, real targets, rather than techniques. As a Wing Chun'er and martial artist, I spend a lot of time with roll-punches (chain punches), cover punches, bong sao/lap sao drills, chi sau, etc. Probably like you do. But they're techniques. And by themselves they're not good enough. For example, during drills my training partners aim at the body or the head. But these are not true targets. They're too general. Better ones would be the throat, or liver, or temple. Ask them to strike those areas, and they have a difficult time doing it. Many times they can't even do it accurately at slow speed. They miss. Brainwash yourself into believing that it's "out of bounds"
Ancient wisdom says: You behave how you train. If you don't train hitting real targets, even the groin, you probably won't do it under a stressful moment when your life is in danger. Instead, you'll fall back on your routine muscle memory. Which in the case of some of my training partners means hitting the head, that includes the skull; or striking the body, which includes the rib cage. This won't cut it if you have three guys trying to end you. Choosing a target that leads to pathological injury, and accurately striking it -- hard -- makes a big difference. Maybe all the difference on the street. 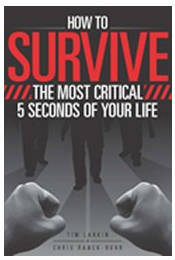 You can buy a copy and learn more about the book, How to Survive The Most Critical 5 Seconds of Your Life, at Amazon. You can learn more about the guys at TFT (Target Focus Training) and download their free stuff here.